I started becoming aware of exercising and healthy eating in 5th grade. But back then, it was mostly just playing outside and not eating too much junk. Now, though, I have made it a lifestyle. And I realize how important it is to learn that at a younger age. But truly, anyone can make a difference in their life if they just make it happen and commit. Just jump in and take action! You’ll learn things as you go along. For me, when I started taking an interest into exercising and eating well, there was no doubt that I had a lot of questions. So after reading in and searching, I eventually learned what comes naturally to me now: To eat well and be active. Having a healthy diet is mostly just common sense. There are so many diets and fads out there that can be so overwhelming, but just remember to stick to your gut! It’s most important to eat real food in moderation, instead of processed, fake ones. Eat vegetables, fruits, lean proteins, and whole grains. Believe it or not, you also need some fat in your diet, too! You can get these from nuts, peanut butter, and avocados. Allow yourself to eat whatever you want every once in a while. Go crazy and have your fill of fried things, or just go with the old burger and fries combo. Anyone need a chocolate meltdown sundae? By doing this, you won’t feel like your missing out on anything, because food, after all, is one of the greatest joys in life. Deprivation has never done anyone good. Yes, there may be much more to this science, but for now, all you need to know are the basics. After this, you can branch off and add to your internal knowledge of health. I know I did. 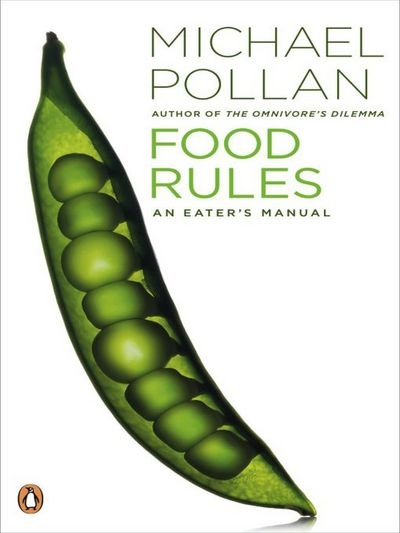 Food Rules by Micheal Pollan is the perfect “Eater’s Manual”. He gives you 64 tips, tricks, and advice on eating wisely, in a very casual, non-complicated way. Ah, this one’s easy. All you have to do is get your patooty up out of that couch and move. Like everyone else, I’ve noticed a huge change in America’s culture. To sum it up, all this new technology and fast food is making us, well, fat. And not to mention unhealthy. When I watch Jane Austen movies set in 18th century England, you never see those perfectly healthy people going to the gym and working out. That’s because they’re lifestyle demanded them to be physical. There were no cars to ride around in, so people walked. There were no TVs, so instead of being locked up inside the house all day, they went outside and took a turn around their fancy English garden. Food was cooked fresh from markets everyday. They were aware that a little exercise would go a long way. Life back then was more natural and alive, and sometimes I wish that we lived more like the people did back then. And it has become more of a chore to get up and get moving. People think of exercising as having to drag themselves to go to the gym for three hours. No! Do something that you enjoy, like taking a walk and enjoying nature. Do yoga, dance, garden, play with kids, run, skip, jump, swim…there are so many options to choose from. This doesn’t have to be at all complicated, unless you over-think it. The Women’s Health Big Book of Exercises is a wonderful compendium of fitness, and probably the only one you’ll ever need. It is truly awesome.And, oh, look at that-they have one for men, too. I just discovered the enthusiastic community of BodyRock.TV literally two days ago. I love it because it has some serious workouts, exercises, and eating tips all for doing right at home. You can also share your support and stories with the many users who go there. It’s like you’re in a candy store. This entry was posted in Health and tagged exercise, healthy eating. Bookmark the permalink.